One of the great marketing slogans of all time might be “Virginia is for Lovers.” Who knows, they might still use that one. Valentine’s Day is for lovers. And here’s an argument that Valentine’s Day is for Pinot Noir lovers. Over the past few years holidays like Halloween and Valentine’s Day have grown in popularity and celebration. Valentine’s Day is the second largest card-sending holiday every year. There are estimates that more than 2.5 billion cards are sent each Feb. 14. The wine numbers are equally impressive. It’s hard to narrow down exactly when consumers pick up their Valentine wine but industry experts estimate more than $8.5 million is spent on wine for the lovers’ big day. And for all those engaged couples, happily married, or dating duos, it’s time to think about the lovers’ day on our annual calendar. A dozen roses, a nice dinner, great chocolate and an even better Pinot Noir can create an awesome and memorable holiday. Let’s start with the chocolate and state the obvious. The names you know are not the ones you want to be pairing with your wine. Even with Pinot you want a darker chocolate. A good starting point for your chocolate is buy one with at least 60 percent cacao. Ghirardelli is a pretty good place to start. It’s easy to find and a really good mass-produced product. They flavor it up lots of different ways but keep it fairly simple with your wines. Two great Indy area chocolatiers, and there are more than two, are Best Chocolate in Town on Mass Ave., and Chocolate for the Spirit, available online. Both make a high-end and elegant chocolate truffles and other treats worthy of your significant others. Sure, artisan chocolates aren’t going to come cheap – you can expect to pay $2-3 per chocolate truffle. But that’s the sort of gift your loved one is really going to appreciate. Recommending a great Pinot in various price points and easy to find is tough but someone has to do it. If you are on a tight budget hit the local grocery wine aisle or liquor store and look for Mark West. The West pinot is almost always under $10, light bodied, but has correct Pinot Noir flavor. It gets easier if you step up between $10-$20 price range there are many decent picks. Meiomi Pinot Noir is very widely distributed and sells around $16-$17. Meiomi Pinot is the biggest selling Pinot in the U.S. It’s a consistent product, perhaps a tad sweeter on palate than some, but a good choice. Step up to the $20-$30 range then you’re talking significantly better wine. I’ve suggested in this column space many times that Lange Estate Winery’s Willamette Valley’s Pinot Noir is one of the best buy wines of any varietal. You can find it in better wine shops in the mid-$20 range. If you want to splurge and go above the $30 price point, I’d recommend a great Oregon Pinot Noir. 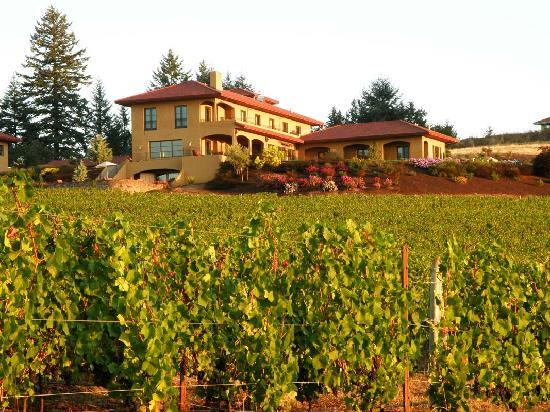 Bergstrom, Lange, Adelsheim, Winderlea, Domaine Drouhin, and Domaine Serene are just a few of the great names from Oregon. Those wines will be in a silky and refined style. If you want something bigger look to Sonoma’s Russian River Valley or the California Central Coast. Buy your bestie some really good chocolate and a nice Pinot Noir and your Valentine’s Day is sure to be a great one. SOMEWHERE IN THE WILLAMETTE VALLEY’S ROLLING HILLS, Or. – Ok, there is no such dateline but it’s an accurate description of our past three days in Oregon wine country. It seems like our daily wine adventures got better by the day. We began our Sunday with a visit to Don Hagge of Vidon Winery. Don should be considered the eighth wonder of the world. The man worked for NASA, earned winemaking in Burgundy, and has a lifetime of accomplishment and interesting connections that should have some author writing a book. Vidon, named for Don and his wife Vicki, is a small boutique winery – the type where the wine is great, production small and sometimes fly a bit under the radar. Spending a little time with Don is great story after great story. And, his wines probably represent the best QPR in the valley – quality to price ratio. Don works with French clones and makes wonderfully balanced and satisfying wines. A testament to Don’s work would be that we bought more wine for shipment home than we did from any other winery. Some of our stash – some! So let’s do a lesson here. It is easiest to let the winemaker ship you the wine if you’re buying six bottles or more. Shipping can run from $60-$100 a case. There are almost always some available deals. Often times if you’re buy six to 12 bottles you’re getting the shipping covered by that discount. I belong to a wine club and get six bottles twice a year. If I buy another six for the same shipment I only pay shipping on six bottles for 12. Most all wineries offer that deal. Our second Sunday visit was next door at J. Christopher Winery. Dr. Loosen, of Reisling fame, invested in Christopher a few years back and the investment shows in the barrel tasting room. We found a couple Pinots we liked but this is the only stop where we paid the tasting fee and moved on. Two of us organized most of the details for this trip. Our two buddies making their first trip were assigned to pick a winery they wanted to visit. Alex chose Trisaetum on Saturday and Patrick B. wanted to visit the iconic Domaine Drouhin winery. Drouhin’s vineyards are stunning and the winery beautiful. We tasted a couple of Roserock wines, their new 200-acre vineyard south of McMinnville. The Chardonnay and Pinot were both good solid $30 wines. The Drouhin wines are always good. The Arthur chardonnay even better than I remember. The signature Laurene ($70) is a stunning wine Our tasting room associate pulled out a 2008 Willamette Valley entry level wine that was one of the best we tasted during our whole trip. We wrapped up at a winery you’ve probably never heard of – Ayoub Winery, in the Dundee Hills. Mohamad “Mo” Ayoub is a native of Lebanon. He only makes 2,000 cases of wine annually and sometimes slightly less. He recently stepped down from a long career in tech and is focusing for now on his winery. His wines are superior. And, that’s not just me saying that. We tasted about 7-8 different Pinot wines half of which had scores of 93-95 from Wine Spectator and Wine Enthusiast. Not a man of many words, but a man of an extremely dry wit and talent for wine making. Oh, his tasting room is his kitchen table in his home. Quite an experience. Dinner was in our hilltop rental with an evening of relaxation. Today, Monday, one of our party heads back early. The other three of us are headed for a Columbia River Gorge and Mount Hood drive. We all have redeye flights home tonight. I think I’ll be spending next few days trying to figure out how much money I spent on wine! Yikes! 2014 group having fun tasting the wines of Alexana Winery in a beautiful outdoor setting. Barrel tasting with Alexana’s winemaker Bryan Weil. The stunning Columbia River Gorge. A quick lunch of local ingredients at Lange. Our 2014 group on my first Oregon Pinot Noir tour. I have all the details up on my 2015 Oregon Tour – this year called: Drink & Eat Oregon. Last year’s wine tour group was so taken by the fool they said I had to add food to the title. So be it. The trip is all set for June 15-20. Read all of the details at the top of the blog under the header: Drink & Eat Oregon! Leading wine trips has been in the back of my mind for the past couple of years. Six years of immersion into learning and appreciating wine has given me some knowledge, experience, and certain contacts in the wine industry. 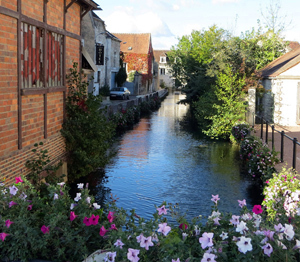 I helped leading a group to France in June through my regular job. I was in charge of four days in Southern France visiting wine country. After that trip, and consulation with a few wine friends, I thought I could start doing one trip a year and then perhaps 2-3 annually in the future. 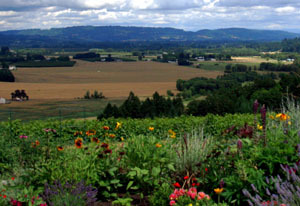 I’ve put together a trip to Oregon’s Willamette Valley, June 9-14. This will be a boutique type trip for people serious about wine. Frankly, this trip could be done a little less expensive but we’re going to eat well and stay in a really fabulous Bed and Breakfast when we’re in the Willamette. Before I go any further, the brochure is linked in the left rail on this page and right here! The trip does NOT include transportation to and from Portland. The trip beings Monday night, June 9 with a reservation in your name at the Hilton Doubletree Inn, downtown Portland. We’ll travel Tuesday morning out to the valley and begin with a tour, tasting and lunch at Lange Estate Winery. 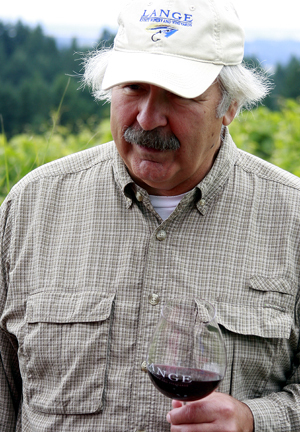 We hope to have Jesse or Don Lange join us to talk about Lange wines. After lunch its the very nice, and very upscale, Alexana Winery which is nearby. Then we’ll check into the stunning Black Walnut Inn. That night we’ll head to McMinnville and dine at one of local winemakers favorites spots – Nick’s Italian Cafe. Wednesday’s action includes an Oregon Pinot/Burgundy side-by-side tasting at Domaine Drouhin. We’ll have lunch at a great boutique winery – Winderlea. And we’ll visit one of my personal favorites, Vidon in the afternoon. We might even squeeze in one more. Dinner that even will be more on the lighter side. 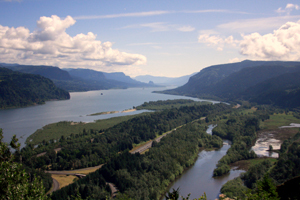 On Thursday we’ll break the routine and head out to take in the stunning Columbia River Gorge. It think it’s one of the prettiest areas in our country. We’ll stop at Multnomah Falls and have lunch in Hood River. That night we’ll have a grand dinner at the fabulous Recipe restaurant in Newberg. Friday’s lineup includes tasting at another boutique winery, a visit to the great ladies at Republic of Jam, and lunch in Carlton. We’ll have an extra hour or so in Carlton to visit some of the great little shops on your own – or even visit a few of the tasting rooms in town. Mid afternoon we’ll head back to Portland where a room at the Doubletree will be reserved in your name. The trip officially ends. You are on your own Saturday to head home or enjoy more of what Oregon has to offer. That’s a quick overview. Check the brochure for more details and cost. I wanted to get this post up to link up some blogs and photo albums from previous visits to the Willamette Valley. July 29, 2011 newspaper column on Oregon Trip. Four photo albums from that trip here, here, here, and here. Here are my blog posts from that trip: Day 1, Day 2, Day 3, Day 4. Most wine drinkers have a bottle or two – or many – stashed away for a special occasion. While much can be said for popping one open on a Tuesday night just because you ARE special, we do tend to squirrel them away with a purpose. I had such a purpose this week for a friend who will be moving out of town for a year. Patrick is my best wine buddy. We normally taste something at least once a week so he will be missed. In Patrick’s honor I went to the storage system and snooped around and decided on a Domaine Drouhin 07 Laurene Pinot Noir. I picked this up in the summer of 2011 while visiting the Willamette Valley and the gorgeous Drouhin winery. 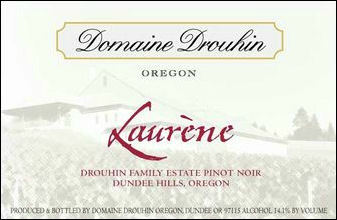 Simply put, the Laurene was one of the best Oregon Pinots I’ve ever enjoyed. I think Patrick might agree. The 07 Oregon vintage has gotten a lot of press for its up and down quality as its aged. But tasting the 07 wines last year was a real job. I was actually in Oregon when most of the 07 vintage was released and there wasn’t much to like, though I didn’t visit Drouhin. Last summer the 07 Pinot Noir really came to life. 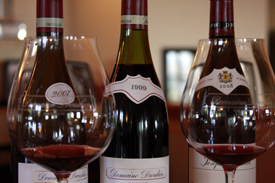 The 07 Laurene is Domaine Drouhin’s top bottling. It doesn’t come cheap at $75 a bottle, though I did find it as low as $57 on the internet. The wine had wonderful complex fruit much more pronounced that some wines of any vintage. There was lovely dark cherry but with a bright freshness you only get in the best Pinot wines. It had strong but well-balanced acid which would have been perfect for some sockeye salmon or steelhead trout. But when I open a Pinot of this quality I just want to sip it. Maybe a little matching chocolate with this Pinot but it should be savored. I didn’t even have to look to guess the critics liked this wine, but I did. Josh Reynolds of Tanzer gave it 90 points. “Brisk, finely etched red fruit flavors carry no excess weight and gain intensity with air. The lingering finish echoes the strawberry and blood orange notes.” That geeky enough for you? Robert Parker scored the wine 91 points, Wine Spectator agreed with the 91 score, and the Burghound jumped it up to 93 points. Again, the price point will scare off many and I understand that. But this is a great example of you get what you pay for.